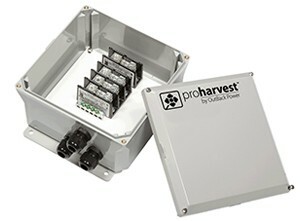 The ProHarvest AC Splice is a compatible junction box suitable for combining up to 3 ProHarvest solar inverters into one home that runs to an AC load center. With a weatherproof NEMA4 polycarbonate enclosure, the AC splice is perfect for mounting outdoors. Includes 3 gland fittings for up to 3 inverter AC cables. Inverter AC cables must be ordered separately.